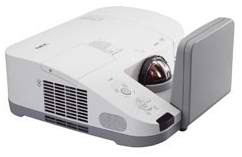 Projectors with almost no shadow and glare greatly improve the use of interactive whiteboards in schools. The integated 3D capability makes you ready for the next step towards the digital classroom. Peace of mind also with regards to the delivery of content is ensured by a large variety of analogue and digital inputs. For mobile use on a cart the projector can also be used in desktop mode. The projector comes with an easy to install wall-mount to ensure the quality of the installation and offers compatibility to various height adjustable solutions. An ideal solution for educational and business use. Almost no shadow and glare – thanks to ultra-short throwing distance. Wall-mount included – for quick and easy installation, compatible with height adjustable sytems. 3D ready – future-proof DLP-Link technology with 120Hz. Free tilting – for desktop use as well as ceiling and floor projection. 3D ready; 6-segment Colour Wheel; Auto Power ON/OFF; BrilliantColor and VIDI technology; free tilt; Kensington security slot; Long Life Lamp; Manual Wall Color Correction; Manual, vertical Keystone Correction (V= ±15°); Off-Timer; Plug&Play; Quick-Start-/ Quick-Power-Off Function; Security Bar; Wall Color Correction incl. whiteboard mode; Windows Embedded Partner.